DURHAM, N.C. -- By synchronizing 98 tiny cameras in a single device, electrical engineers from Duke University and the University of Arizona have developed a prototype camera that can create images with unprecedented detail. The new camera has the potential to capture up to 50 gigapixels of data, which is 50,000 megapixels. By comparison, most consumer cameras are capable of taking photographs with sizes ranging from 8 to 40 megapixels. Pixels are individual “dots” of data – the higher the number of pixels, the better resolution of the image. Details of the new camera were published online in the journal Nature. The team’s research was supported by the Defense Advanced Research Projects Agency (DARPA). 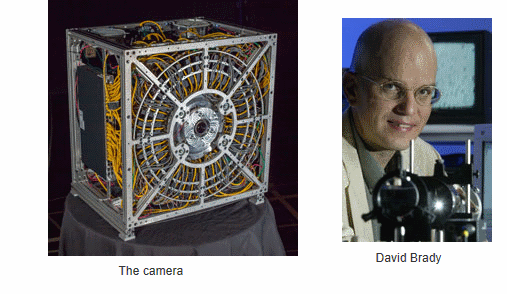 The camera was developed by a team led by David Brady, Michael J. Fitzpatrick Professor of Electric Engineering at Duke’s Pratt School of Engineering, along with scientists from the University of Arizona, the University of California – San Diego, and Distant Focus Corp.
“Each one of the microcameras captures information from a specific area of the field of view,” Brady said. “A computer processor essentially stitches all this information into a single highly detailed image. In many instances, the camera can capture images of things that photographers cannot see themselves but can then detect when the image is viewed later." The software that combines the input from the microcameras was developed by an Arizona team led by Michael Gehm, assistant professor of electrical and computer engineering at the University of Arizona. “Traditionally, one way of making better optics has been to add more glass elements, which increases complexity,” Gehm said. “This isn’t a problem just for imaging experts. Supercomputers face the same problem, with their ever more complicated processors, but at some point the complexity just saturates, and becomes cost-prohibitive." The prototype camera itself is two-and-half feet square and 20 inches deep. Interestingly, only about three percent of the camera is made of the optical elements, while the rest is made of the electronics and processors needed to assemble all the information gathered. Obviously, the researchers said, this is the area where additional work to miniaturize the electronics and increase their processing ability will make the camera more practical for everyday photographers. Co-authors of the Nature report with Brady and Gehm include Steve Feller, Daniel Marks, and David Kittle from Duke; Dathon Golish and Esteban Vera from Arizona; and Ron Stack from Distance Focus.